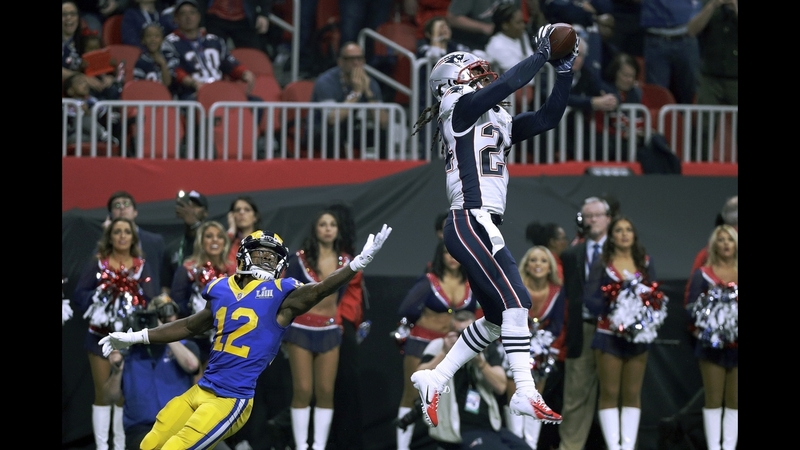 Tom Brady and the New England Patriots captured their sixth Super Bowl victory in franchise history, defeating the Los Angeles Rams 13-3 on Sunday night in Atlanta. Although both teams came into the matchup known for their offense, defense was the name of this game. After a season filled with doubt and question marks, New England became the second team to win six Lombardi Trophies and have won them all over the course of 18 years. This was the lowest scoring game in Super Bowl history. A credit to both defenses. Through three quarters there were no touchdowns scored, which is a SB record. Los Angeles forced a Brady interception on his first pass of the game. LA was able to put enough pressure on Brady to make him feel uncomfortable at times, forcing errand throws and quick releases to covered receivers. Things looked great for the Rams until the fourth quarter, when New England scored 10 unanswered. For the Patriots, every level of their defense excelled. Pressure on Jared Goff all game long was key in forcing punt after punt. New England was able to sack Goff four times while knocking him down a handful of times. My pick for defensive MVP in this game and really all season long has to be Stephon Gilmore. The corner was first team all-pro this year, and completely locked up Rams receiver and former Patriot Brandin Cooks. Gilmore also grabbed a crucial interception in the fourth that all but sealed a Pats win. New England held the Rams to a mere 62 yards on the ground and a stifling 260 total yards. Outside a Greg Zurlein FG in the third quarter, the Rams were shutout. Pretty Impressive performance by a Patriot team that yielded 41 points to Nick Foles and the eagles in the same game a year ago. No one is more clutch in big moments than Julian Edelman. The SB LIII MVP had a huge performance (10 catches, 141 yards), reeling in some big catches late in the game. Jules sits behind the great Jerry Rice for all time postseason receiving yards and receptions. There was a lot of talk leading up to this game on whether or not Jules is a HOF candidate. Edelman is a year removed from an ACL tear recovery that found him sidelined from last years SB vs. the Eagles. You could tell this postseason that Jules wanted this championship bad. He was a one man wrecking crew in the divisional round against the Chargers and as well in the AFC title game vs. Kansas City. I know the HOF voters aren’t supposed to solely decide on a players postseason accolades, but in this case, it would be hard to dismiss. For a guy who doesn’t wow in the regular season, the post season numbers, along with three Super Bowl rings make him a sure fire, first ballot hall of fame player. This game was a chess match, mastered beautifully by Bill Belichick. There’s no one better at taking a teams strength and making it a weakness. Sean McVay was just the latest victim. You have to credit the guy, just 33 years old and already has one Super Bowl appearance in just his second year as a head coach. What he’s able to do offensively is next level. However, McVay had never faced Bill Belichick. There were times in this game where you felt the Rams wouldn’t score at all. LA ranked 2nd in offense all season, and Bill put together a game plan that would have you thinking the Rams were one of the worst teams offensively. A big plus for New England, was the fact there were no head scratching decisions from Belichick in this years game, like lasts years decision to sit Malcolm Butler. This was just classic Bill, doing what he does best, and that’s winning football games, no matter the opponent. This wasn’t Brady’s finest performance by any means, but he did orchestrate a fourth quarter game winning drive in yet another SB. He had some bad moments, like his first pass attempt being intercepted. He also has some vintage Brady moments, finding Edelman all game long, and setting the Patriots up on the one yard line after threading the needle to Rob Gronkowski, who was guarded by three defensive backs. Now the oldest QB to win the SB, TB12 has no inclination to stop playing anytime soon. Earlier in the week, Brady sat down with ESPN’s Jeff Darlington, who asked if this was his last game. Brady’s response? “Zero” chance. The goat wants more rings, and it’s likely he’ll get at least one more. Granted this team doesn’t lose anyone, they’ll be a heavy favorite to repeat as world champs, with Brady under center for his 19th season. Rob Gronkowski has had a number of injuries in his career, some that have caused him to miss a lot of time. The big tight end has been mum on whether or not he’ll retire after winning his third ring, but sources close to him and the Patriots believe it’s possible. Already considered the best TE to ever live, there isn’t much more Gronk has to accomplish as a player. After a all-pro caliber season last year, the numbers this season declined heavily. Primarily due to injury and the offensive scheme New England portrayed this year. Gronkowski was still very affective this season, especially during this magical postseason run. Blocking is an underrated trait of a great tight end, and there has and will be no one better at the position than No. 87. Gronk’s biggest moments this postseason came with him “throwing people out the club”, as he would say. The catch he made in the fourth quarter against three Rams defenders was next level greatness. That play set up a game winning Sony Michel TD. If this was indeed his last ride in the NFL, he too will he a first ballot HOF inductee. Something tells me he’ll be back for one more go around. In the meantime, if there’s one thing to expect from Gronkowski this offseason? A never ending Super Bowl victory celebration. Connor Clement is a sports broadcaster, and recently started working for Harvard and ESPN+ as a play-by-play and color commentator, as well as a sideline reporter. A native of Maine, Connor attended the University of Southern Maine where he earned his degree in Communications. At USM Connor hosted his own sports talk show on the local radio station (WMPG), and worked for the Celtics G-League affiliate the Maine Red Claws. Connor also interned for NBC in Portland, covering the Patriots, Bruins, Red Sox and Celtics.